One of the many things we’re grateful for over the last six years has been the opportunity to meet some incredible people. I’ve come to understand how naive I was before Alexander was born to the challenges that so many children and their families face, and the amazing people that help them get through these challenges. We all have fond memories of specific people we’ve encountered along this journey, and I consider myself blessed to be able to count several. I’d like to share the story of one person in particular. In the weeks leading up to Alexander’s first operation, we began to face some difficult questions. We had been told right from the start that the first surgery would likely be the most complicated, and posed the greatest risk. The Coles vein repair adds another level of complexity to the Glenn that can lead to complications during recovery. “You need to understand, this is a big operation, and Isomerism almost always throws curveballs,” was what our surgeon told us. “Is Alexander going to make it through this?” I asked him. He gave us his estimate of Alexander’s chances. It was more optimistic than I was expecting, and led to a very interesting conversation. Our cardiologist began by telling us how hesitant he is to provide numbers. “If I were to tell you Alex has a 99% chance of 30-day survival, you would be thrilled. The trouble is, the other 99 don’t matter, if you’re the one.” he said. “The simple fact is, I can’t predict with absolute certainty if any of us will be here a year from now. I know why you asked me, but so much can happen. It’s impossible to predict the future. If you want my best guess, I think you’ll be home with your son in three weeks,” he concluded. That was good enough for me. Our cardiologist was an amazing man. He’s since moved on to pursue opportunities south of the border, and he’s actually not the person I decided to tell you about today. The person I want to talk about was a nurse on the cardiology ward at SickKids. We need to take a step back to Alexander’s Glenn / Coles again, which was performed on November 11th, 2009, not long after the discussion with our cardiologist I just recalled. I would have told you at the time that Alex had a very difficult recovery. His discharge summary states that Alexander had “a complicated recovery course with persistent desaturations.” In getting to know other heart-parents, I’ve since learned what a difficult recovery can actually look like, but I won’t take anything away from how we felt at the time; we were terrified. Alexander was in the CCU for 11 days. He was extubated multiple times, had a lung infection, and desaturations that at times dipped into the 40%’s and led to an unexpected catheterization. We were on H1N1 watch, had symptoms mimicking Morphine withdrawal, and of course, our old friend Chylothorax. It was a very difficult time. Looking back, they did warn us that the recovery would be a series of “two steps forward, one step back” but they never mentioned it would be so hard to see the steps forward! Things didn’t get easier after our transfer up to 4D. This is when Alexander’s pain symptoms were at their peak, though it actually ended up being intolerance to Domperidone, not Morphine withdrawal that was causing problems. His response to the pain was also in part responsible for his saturation issues, as he was bearing down and crying so much. On about day four up on 4D, in the middle of the night, things came to a head for Mom and Dad. Michelle and I typically balance each other out, we’re a good team. When I’m having my tough moments, she’s there to bring me out of it, and I’m usually able to do the same for her. Not on that night. We were both in a pretty sorry state. Alex had been crying for hours, they were switching back and forth between the prongs and the hood for oxygen, we were exhausted, Alex was in pain, and nobody knew why. They’d even mentioned a return to the CCU if things didn’t improve. It’s amazing to me that three words said at just the right moment can have such an impact. I remember it so clearly. I can see her face as she said them; I can see Michelle’s composure return, and with it, my calm. It was like she was reminding us she needed our help too; she couldn’t do it on her own. With those words, we knew that it wasn’t over, but we were going to get through it. She’d seen this sort of thing before, and understood we just needed to get through one more day, and then the day after that, and the day after, and so on. If we could stay strong for him, everything would be OK.
I’m not sure that’s what she actually meant, but sometimes the interpretation is more important. We found the strength she asked for. It was remarkable to see such composure in someone so young; under circumstances most people her age couldn’t imagine. Alexander began to show improvement the next day. The Domperidone was stopped, his saturations stabilized, and things got better for us from then on. 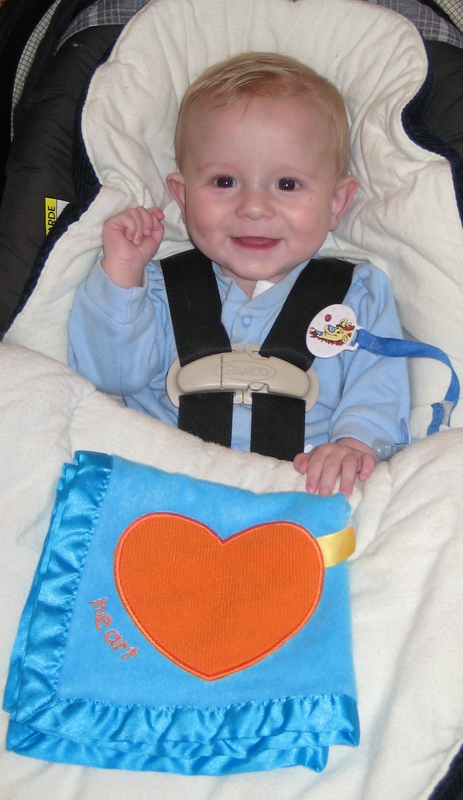 Alexander was discharged from SickKids three weeks to the day from when his Glenn/Coles was performed. Our cardiologist’s “best guess” was pretty accurate after all, though we’d have never thought we’d be home in three weeks after the way the first two went. Two steps forward, one step back. Alexander only had that special nurse once. Whether by luck, fate, or design, she came into our lives just when we needed her. The next time we saw her was at our follow up clinic a week later. We stopped in the SickKids atrium to get a coffee, and she waved at us as she was heading upstairs. Alexander had touched her life that long night too, and of course we agreed. She gave our little boy a soft kiss on the forehead, smiled, turned, and was gone. It became a mantra for us. Alex has had two major surgeries since, and many times those words have echoed in my head. I’ve repeated them to Michelle; I’ve sent them to old friends with sick children. I’ve said them to new acquaintances in our group of heart-parents, and I doubt anyone understands what they mean to us. In the absence of our experience, the significance likely gets lost. Our cardiologist was right about another thing. None of us knows where we’ll be a year from now. So much can happen. It’s impossible to predict the future. The name of our nurse was Natasha Cardoz. Natasha was killed in a car accident in the summer of 2011. We found out when we inquired about her during Alex’s Fontan recovery. The nurse we asked broke down immediately, they were very close. It doesn’t make sense, much like many things we’ve seen since we became heart parents. She was intelligent, young, vibrant, and had chosen a career helping God’s most precious creatures, and yet, in the face of astronomical odds, she was the one. Natasha remains now a treasured memory and a face from our past; one of the many faces I see when I watch Alexander laugh, run and play. Even though it was only for one night, his story would not be the same without her.